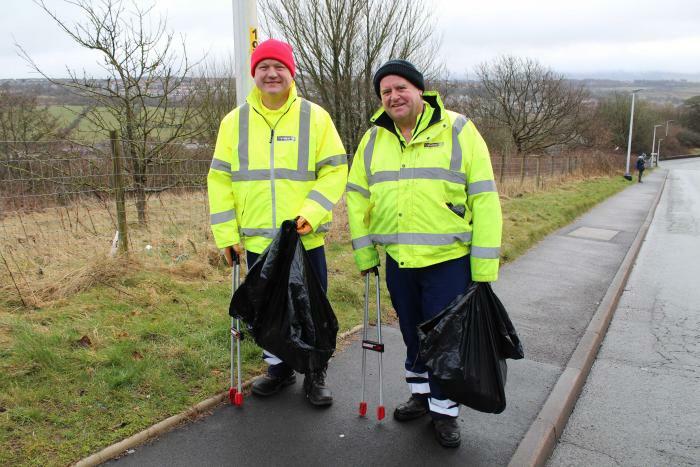 Mike Starkie spoke out as he joined the Copeland Borough Council waste team to clear the litter found in the town centre and on roadside verges in Whitehaven. He has also called for all fast food restaurants to help tackle the issue. In the last month alone, the team has amassed a staggering 190 bags of litter collected from the boroughs roadsides. A total of 57 bags of rubbish were collected on the road from Whelpside to Frizington Road, 26 bags were collected in the Cleator Moor area – from the junction of Birks Road to Bowthorn Road. A further 57 bags were collected from verges in Whitehaven and Moresby, including the area of Whitehaven Golf Course and Scilly Banks to School Brow. The team also collected 36 bags from the B5295 (that runs past Copeland Pool and through Keekle) and 14 from the A595 between Westlakes Science Park and Moor Row. Copeland Council launched the Copeland Pride of Place campaign in January this year to highlight everything that is positive in the borough and to shine a light on those individuals who disregard our communities through vandalism, fly-tipping, dog fouling and littering. Mr Starkie said: “We need to begin to tackle this issue at the source and condemn the litter louts who see fit to just discard their rubbish in our beautiful countryside and expect someone else to clear up after them. “We live in one of the most beautiful parts of country, two thirds of Copeland is in the Lake District which visitors flock to from all over the world. “Despite the great work that is carried out by us here at Copeland Council and the numerous community groups and residents who take enormous pride in their area, it’s a disgrace that the minority have no respect for their surroundings. “Time and time again, for example, our teams are clearing up fast food waste and in particular McDonald’s packaging from roadside verges where people have clearly finished their meal and thrown their litter out of the car window, this must stop! “I am personally going to write to the manager of Whitehaven McDonald’s to suggest that registration numbers are written on each bag that is handed to customers using the drive-through facility. Any evidence of littering can then be handed to our Enforcement Officers for prosecution. For more information on the Copeland Pride of Place scheme go to www.copeland.gov.uk or follow the campaign at facebook/Copeland-Pride-of-Place or twitter.com/CBCPrideofPlace.